Manufacturer of a wide range of products which include safety barrier gates. 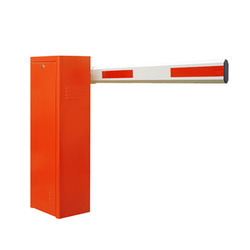 Safety Barrier Gates are many available solutions, with incorporated control unit, which differ for the length of the bar and the type of finish of the protection cabinet and of the motor body and control unit, in order to control all types of entrances, from narrow ones which require a quick opening of the barrier, to the wider ones, up to 8 m of width. They don't require any predisposition for the installation or periodic maintenance and are equipped with a wide range of accessories for a state of the art system. Barriers with long bars are available, ideal to control wide industrial entrances and loading/unloading of goods areas; thanks to a particular function called 'master/slave' it's possible to automatically synchronize two opposite barriers allowing the automation of wide entrances up to 8 and 12 meters.